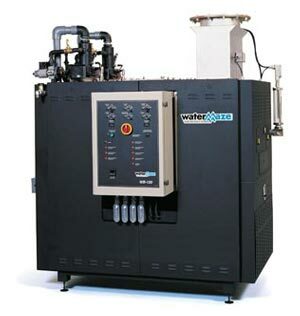 We offer Water Maze water treatment systems. 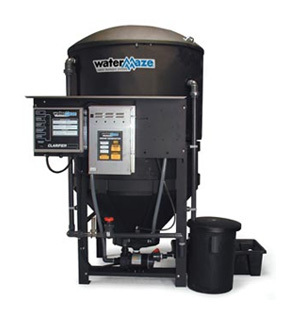 No other manufacturer in the high-pressure cleaning equipment industry offers such a breadth of selection in water treatment and recycling systems as Water Maze. 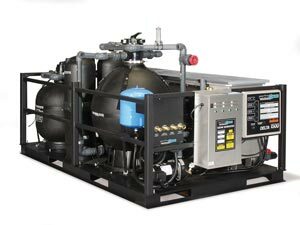 Today Water Maze offers a number of water treatment systems, each developed to meet the needs of virtually every high-pressure cleaning application. Water Maze systems have been certified to UL safety standards and are manufactured under the internationally recognized ISO-9001 standards for quality processes. The Water Maze Alpha is a highly effective above-ground oil-water separator designed to discharge wash water to the sanitary sewer at rates of up to 30 GPM. The genius of the Alpha is the proprietary "maze" design of up to 1000 sq. ft. of inclined coalescing plates, which draw oils from wash water. The plates are strapped together in packs and are easily lifted out for cleaning. 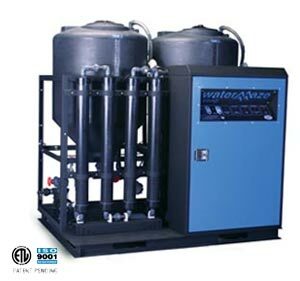 Water Maze’s EC2-20A is an advanced Electro-coagulation (EC) system for treating wash water and other industrial waste water that contains suspended solids, emulsified oils, and heavy metals. This system combines both EC water treatment technology and chemical flocculation to enhance and speed up the process of removing constituents from the waste water. The patent pending design of the Water Maze EC-20A system allows an extremely efficient rate of removal of oils, solids and metals from the waste stream. After the electro-coagulation reaction has occurred in the electrolytic cell, a small amount of EC+ polymer is injected to quickly clump the coagulated oils, solids & metals together for removal. 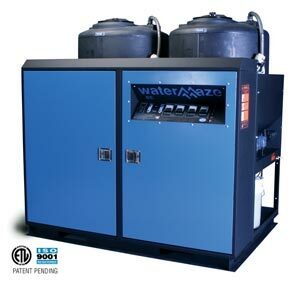 Water Maze’s CLP mechanical filtration systems are the standard in the high-pressure cleaning industry for automated wash-water recycling. All are totally automated using a digital sequencer to monitor and control the system’s functions including filtration, recirculation, filter backwash and sludge discharge. A variation of the CLP series is the CLPB series, which features a unique blend of mechanical filtration with bioremediation technology for highly effective wastewater treatment especially in waste hauling and landfill operations. The Water Maze CoAg2-20A System is an advanced chemical treatment system, using the method of adding a chemical coagulant and polymer to the treatment process, to efficiently remove suspended solids and emulsified oils from the waste stream. 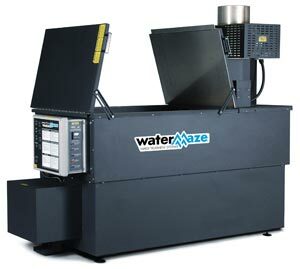 The new Water Maze CoAg2-20A System is a very low maintenance, cost effective system to operate. The CoAg2-20A can be used on its own as the primary water treatment system, or as a pre-treatment system with other technologies, such as Electro-Coagulation or Bioremediation. The Water Maze Indexing Polishing Filter (IPF) can be applied as pretreatment, or post treatment to another water treatment technology to remove particulates. The IPF employs various micron size media paper to filter out particulates in water. The IPF receives and distributes influent water with particulates across the media paper, which is recessed into the filter bed. The uniquely designed filter bed lightly, but firmly holds the media paper against the conveyor chain and allows the paper to slide or index forward as directed by the float and drive system. The IPF comes with adjustable support legs to accommodate different sump sizes. Or, it can be lowered over the top of an existing sump drain. 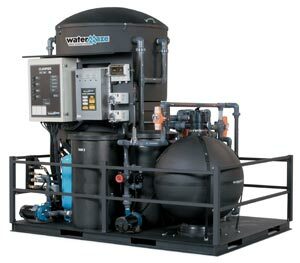 No other wash-water treatment system is as versatile and modular as the CL series. The six models can stand alone or be matched with a Filter Pac III module (below) to serve as a solids separator, a treat-and-discharge unit or a recycle system. The CL-30, for instance, can pre-treat wastewater as a solids separator. 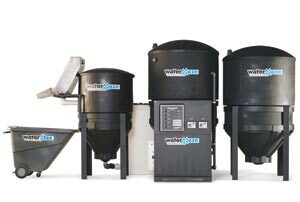 The CL-603 models are full recycling systems when matched with the modular Filter Pac III. The CL, CL-600 and CL-603 models also have an optional ORP/pH Controller for monitoring and controlling pH and injecting sanitizers as well as acid/base stabilizers. The CLT-300 and CLT-600 are cone-bottom tanks (300 and 600 gallons) that can be used as a pre-treatment or post-treatment auxiliary tank. The Water Maze BioSystem or CLB series employs the latest bio-technology for treating and recycling a broad range of commercial and industrial wastewater, including golf and turf applications where there’s a high organic content in the waste stream. The CLB’s unique design features modular components so the system is customized to match each customer’s application requirements as well as to keep the equipment cost and performance to only what is truly needed. Moreover, the systems are automated for ease of maintenance. Water Maze’s Delta low-profile, wash-water recycling systems are ideal when a wash facility is already equipped with a collection pit or pre-treatment system. 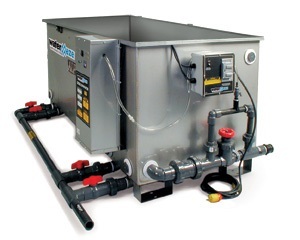 With flow rates of up to 30 GPM, Delta systems are self-contained and, with their low profile, can be conveniently and relatively quickly installed inside a building or next to a wash pad. 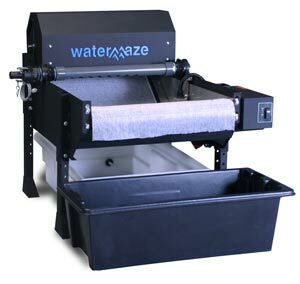 Water Maze offers several models of evaporators that use the conventional hot-plate technology with a unique high-efficiency combustion chamber to dispense of up to 90% to 95% of a waste stream so only 5% to 10% has to be hauled off. There are three models of the HBG / HBE evaporators, They are capable of evaporating wastewater at 8, 15 and 30 gallons per hour. The natural gas-heated HBG systems have two models. The all-electric HBE, featuring eight 2600-watt coil-type heater, has one model with either 230V 3ph or 460V 3ph configurations. Featuring top-of-the-line immersion tube jet burner components, with a solid-state flame control monitor, the WB evaporators are capable of creating temperatures of up to 2000°F, releasing hot flue gases directly into the water.